A company out of the Netherlands, Blackbelt 3D, is bringing out the most innovative 3D printer we’ve seen since last March. It’s an infinite volume 3D printer that’s built for autonomous production. This printer can produce row after row of 3D printed parts, or it can print an object longer than the build plate. If you have enough time, filament, and electricity, there’s no reason you couldn’t print a plastic beam hundreds of meters long. The specs on this printer are about what you would expect from a large machine meant for industry or prototyping, as opposed to a machine designed to print out tugboats and fidget spinners. The Blackbelt uses interchangeable print heads for the hotend with 0.4, 0.6 or 0.8 mm nozzles. The filament feed is a Bowden with the extruder hidden under the control panel. The frame is explicitly Bosch extrusion, and the machine’s build volume is 340 mm by 340 mm by whatever. Retail price (on Kickstarter) comes in at €9,500, but for an extra €3,000 you can also get a neat stand with casters on the bottom. Of course, with an infinite build volume, you could also print a stand. But Wait, Isn’t This Patented? Most of the online commentary surrounding the Blackbelt 3D printer focuses on a forgotten offshoot of the RepRap project. The Continuous Belt Production of the RepRap project resulted in the development of MakerBot’s Automated Build Plate. Unfortunately, the method and apparatus of MakerBot’s Automated Build Plate were quickly patented under Stratasys rule, and Open Source development for an APB stalled. The reasons for this dip in development could be fears of litigation or the fact the APB never worked that well in the first place. The online commentary for the Blackbelt and the development pedigree tracing back to a project from [Charlie Pax] and NYC Resistor is, in fact, incorrect. The first time we’ve seen anything like this was last March, at the Midwest RepRap Festival. There, [Bill Steele] of Polar3D demonstrated a project he had been working on for the past few months. It was an infinite build volume 3D printer, that was according to [Bill], designed as a mechanical middle finger to MakerBot. The infinite build volume 3D printer demonstrated at MRRF was simple, but all the building blocks to build a Blackbelt are there. The bed is tilted at 45 degrees, the bed is a conveyer belt, and there’s just a tiny bit of G-code wizardry to bring everything together. In speaking with [Bill Steele], he says he’s not interested in pursuing the ‘infinite 3D printer’ concept commercially, and this build was only possible because of a poorly written patent on MakerBot’s behalf. The MakerBot patent, for example, decouples the XYZ axes from the bed, and requires the bed to be flat. [Bill]’s work gets around these patents, and in the process creates a 3D printer with an infinite build volume. While [Bill]’s unnamed but extraordinarily innovative 3D printer only made a short appearance at MRRF, a few people there found it to be the most ingenious printer in recent memory. 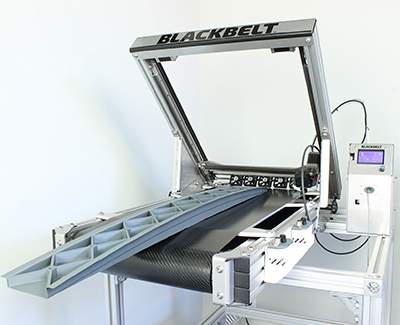 Apparently, the Hackaday article caught a few eyeballs, too: Blackbelt 3D BV, the company behind the Blackbelt printer, was formed the week after MRRF. Now, with the concept proven, we’re really looking forward to a RepRap-style infinite-build-volume 3D printer. A kit machine with a build volume of 200 mm by 200 mm by whatever would be amazing. It could print out a line of 3D printed tugboats, or some very interesting bits and bobs that don’t fit into a normal printer’s build volume. While we can’t speak to the future of the Blackbelt Kickstarter – and the standard reminder of the history of 3D printer projects on Kickstarter – a DIY infinite build volume printer would be fantastic, and we can’t wait for the community to step up and accept the challenge. You also need hundreds of meters of empty space! Hundreds of meters of empty space? That sounds like a challenge! Oh no! wherever shall I find an empty warehouse? I think you are overselling the concept. Build volume hasn’t been a major limitation of hobby printing, especially when you consider how long large prints can take. Slanting the bed makes set of printable geometries more complicated, as overhangs and other features behave differently or even become impossible depending on how they are rotated. Layer orientation is extremely important when printing because it controls surface finish and strength. I’m not sure you want to be paying 12 grand for a printer that can’t produce horizontal layers. You’re looking at it too linearily. This allows one to make a very compact machine that fits on anybody’s desk like a normal paper printer, yet can print large objects. It simply pushes the printed object out onto a tray, which can fold up to shield the mechanics when the machine is not in use. It also realizes the possibility of the 3D printer printing itself in one piece. Imagine if the frame of the printer is wider than it’s tall. Well, you simply print it out sideways and it fits through its own aperture. It can even print a bigger printer than itself. There was a cool concept cgi video about a molecular 3d printer a few years ago. I told my brother all you would have to do was get the smallest one. Print another printer that is narrower but longer, then use that one to print a 3rd printer that is wider. Ending up with a printer that is magnitudes larger than the first printer. https://www.youtube.com/watch?v=vEYN18d7gHg Like this but the video i recall was just a cgi demo with music. As a hobbyist struggling to print a helmet in 16 pieces and get them all to fit together, I politely disagree. What if it was somehow possible to have a roll-down curtain that would adhere to the printed part and essentially hold it up so your print head can be tilted a full 90 degrees relative to the bed? No more overhang supports whatsoever. The print head would move sideways along a slit between two rollers that peel the curtain on and off the part. How does the curtain adhere? Electrostatically? The designer (and many instructions) disappeared from the Internet two weeks after. Material and tool requirements are so… Hackaday ! Isn’t it the first infinite build volume repstrap ? How do they manage to get an infinite build volume in a finite universe? Probably just means the printer runs slowly enough that it can’t keep up with rate of spacial expansion. Still just makes it sound like they don’t know what they are talking about. Or perhaps “infinite” is being used here in practical terms because they are not insufferable pedants. @Steven Gann, I believe M H was making a joke. And you should refrain from making personal attacks.